Guest blogging is the most effective SEO methodology. The building block of a successful SEO strategy is gaining authority and credibility in your niche by generating quality backlinks from other websites. Guest posting is a perfect way to increase your search engine rankings, expand your reach and make yourself visible across the web. For start-ups and newbie bloggers guest blogs are indisputably best way to build their reputation, expertise and brand awareness. Guest posting is the corner stone of content marketing, digital marketing, startup marketing, growth hacking and brand marketing. To get exposure to new audience you should guest blog not only for websites in your niche, but also for other relevant niches in your field of expertise. For example, if your niche is medical supplies, you can create content and contribute to a blog about lifestyle, yoga, meditation and healthy living. If your niche is psychology, you can contribute to blogs about relationships, ie ‘How to choose your perfect life partner based on your personality type’. Guest blogs expand your brand’s visibility, authority and audience reach. Finding the guest blogging opportunities can open doors to acquire new audience by putting your content in front of more people. Guest blogging connects you to new people and help you build relationships with other experts, bloggers and websites in your niche market. Such business networking and partnerships allows you gain more subscribers and ultimately grow your business. Guest blogs gives you a platform to demonstrate your expertise and knowledge in your niche. Guest blogging is a sign that you are respected by other websites within the niche. This provides you the status of an influencer. Guest blogs helps you to attain higher conversions by leading visitors to a landing page on your website through referral traffic. Guest blogging is one of the best ways to get backlinks to your website and social media profiles. Backlinks improve your domain authority and search engine rankings. This increase overall traffic to your website. Guest blogs boosts your social media presence and Increase your fans and followers count. You get more shares, tags and mentions on social media. 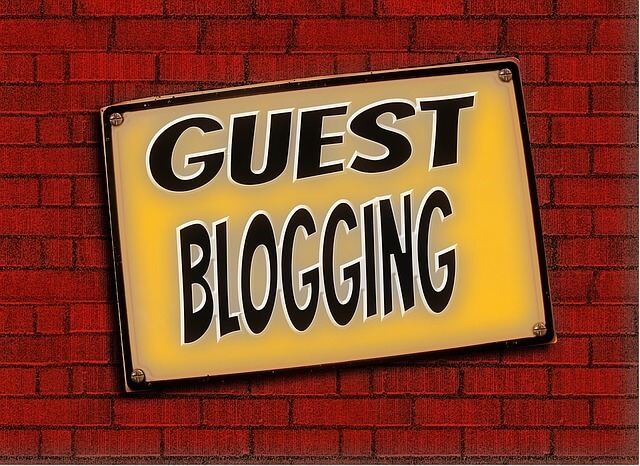 Guest blogging improves your writing skills. You grow as a writer with each piece of quality content that you create. Feedback from editors of host website helps you to grow as a content writer. Once you get enough experience writing in different categories, you can use your talent to earn more money in the growing content creation industry as an established writer. How to submit guest blog? First check if the website requires you to pitch the article with a synopsis or asks you to submit the full article for consideration. If the website asks you to send them your article pitch, craft a 150-200 words brief article description with multiple headline variations and a small author bio. In your email include few links to posts already published by you. If the website requires you to send them full article for consideration, do not waste time formulating the pitch. Instead turn on your creativity and submit the guest post with author bio directly. This cannot be stressed enough. The websites that accept guest blog always have a ‘Write for Us’. ‘Article Submission’ or ‘Guest post submission guidelines’ on their website’s header or footer. Guest post submission guidelines tells you the procedure and requirements to submit the guest blog, minimum word count for the guest post, content guidelines, acceptable links and if the website accepts republished post. Create your content based on the article submission guidelines. If the guidelines explicitly mention original content, do not write spin off articles or copy paste content from article that has already been submitted elsewhere. Avoid promotional language, generic and simplistic advice. Make sure the post contains new and original ideas. Incorporate relevant images with source links. Most websites allow external links in the guest post. Links from your guest post should redirect to a carefully crafted landing page on your website. Your author bio is an important factor that determines the success of your guest blogging strategy. Emphasize on your expertise and knowledge of the subject. Never use the same author bio for all website. Instead create a keyword rich author bio every time and add a link to your website and relevant social networks. You can incorporate a call-to-action within your author bio. It is always a good idea to proofread your article multiple times to check for wookie mistakes, grammar, coherency and formatting. Submit your guest post and wait for atleast a week for response. Be prepared for additional editing requirements or feedback from the editor. Hopefully, your guest post will be accepted. If not, try submitting the article to a different website. Formulate a marketing strategy to get the maximum benefits from guest blogging. The landing page on your website should follow basic best practices and include a strong call to action. Prepare your email marketing strategy with a newsletter sign-up form and a welcome newsletter with discounts or free download offers. Energize your social media accounts and participate in conversations related to your blog or business. Promote the published post on various social media, Q/A sites and forums to gain additional traffic. Sending emails to wrong websites– If the website does not mention about guest blogging or have article submission section, do not waste your time in sending emails with article pitch. Instead focus on websites that actually accepts guest blogs. Not creating content- It often happens that bloggers spend so much time sending emails with their article pitch that they actually get no time to create the content. The golden rule of guest blogging is to create the content first. When your content is ready pitch it to different websites or submit it directly for consideration depending on website’s article submission guidelines. If the pitch is not accepted by few websites, you drop the idea and never write that content. If the pitch is accepted, you lose focus on your goal and procrastinate the actual content creation part, especially if deadlines are not given. If the same pitch is accepted by multiple websites, you either spin the same content for all of them or do not keep your promise to guest blog on other websites, which harms your reputation, especially if you are from small niche or industry. Reading article submission guidelines properly is the first step towards getting your article published. It is futile to send an article pitch email if the website asks you to submit full article along with author bio for consideration. Sending copyrighted content– Most websites require the guest bloggers to submit original content. Forwarding content already published somewhere else or republishing the same content on a different publisher website can bring you a bad name. If you send copyrighted images along with the article, make sure to include source links. If the website does not accept already published post, you can request them to provide you backlink from a relevant post on their website with an offer of social media promotion. Using promotional and excessive sales pitch– Your guest post should be an informative article. Many websites clearly mention their policy on sponsored content and affiliate links. You should obviously mention about your own website and services but it is crucial to maintain a neutral tone. Instead focus on providing actionable tips and ideas. It is important to make a distinction between guest posting and posting sponsored content. Some websites will refuse to accept your guest post due to its sponsored content or excessive sales pitch but might accept the content under their advertising program. If you want to post an article about your new book, product or services you should rather inquire about advertising and promotion services offered by the website. If you would like to guest blog for howtowhere.com kindly read the article submission guidelines here.